This figure shows the variations in concentration of carbon dioxide (CO2) in the atmosphere during the last 400 thousand years. Throughout most of the record, the largest changes can be related to glacial/interglacial cycles within the current ice age. Although the glacial cycles are most directly caused by changes in the Earth's orbit (i.e. Milankovitch cycles), these changes also influence the carbon cycle, which in turn feeds back into the glacial system. Since the Industrial Revolution, circa 1800, the burning of fossil fuels has caused a dramatic increase of CO2 in the atmosphere, reaching levels unprecedented in the last 400 thousand years. This increase has been implicated as a primary cause of global warming. This figure was originally prepared by Robert A. Rohde from publicly available data and is incorporated into the Global Warming Art project. This image is an original work created for Global Warming Art. The GNU Free Documentation License Version 1.2; with no Invariant Sections, Front-Cover Texts, or Back-Cover Texts. (red) Law Dome ice core: D.M. Etheridge, L.P. Steele, R.L. Langenfelds, R.J. Francey, J.-M. Barnola and V.I. Morgan (1998) "Historical CO2 records from the Law Dome DE08, DE08-2, and DSS ice cores" in Trends: A Compendium of Data on Global Change. Carbon Dioxide Information Analysis Centre, Oak Ridge National Laboratory, U.S. Department of Energy, Oak Ridge, Tenn., U.S.A.
(cyan) Siple Dome ice core: Neftel, A., H. Friedli, E. Moor, H. Lötscher, H. Oeschger, U. Siegenthaler, and B. Stauffer (1994) "Historical CO2 record from the Siple Station ice core" in Trends: A Compendium of Data on Global Change. Carbon Dioxide Information Analysis Centre, Oak Ridge National Laboratory, U.S. Department of Energy, Oak Ridge, Tenn., U.S.A.
(black) Mauna Loa Observatory, Hawaii: Keeling, C.D. and T.P. Whorf (2004) "Atmospheric CO2 records from sites in the SIO air sampling network" in Trends: A Compendium of Data on Global Change. Carbon Dioxide Information Analysis Centre, Oak Ridge National Laboratory, U.S. Department of Energy, Oak Ridge, Tenn., U.S.A.
CO2 at Mauna Loa since 1958. Trends of major greenhouse gases. Solar variation and greenhouse gases during 420,000 years. Recent global CO2 emissions, logarithmic scale. Carbon dioxide variations during the last 550 million years. 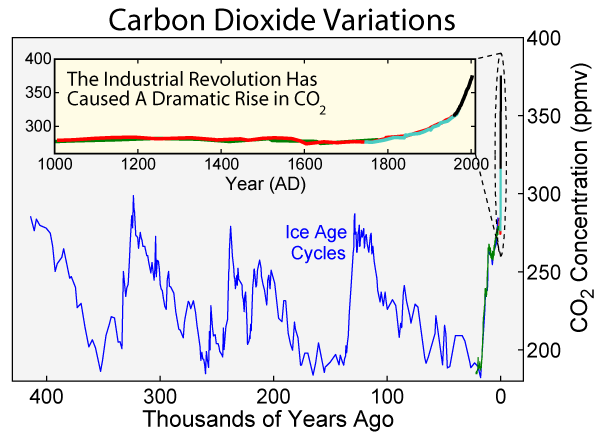 400,000 year Carbon dioxide variation (ancestor image). 650,000 year Carbon dioxide and temperature variation showing correlation.